The Blade® brand raises the bar yet again with the mSR X—the world’s first fixed-pitch ultra micro heli with advanced AS3X® flybarless stabilization. The core of AS3X technology is a sophisticated, 3-axis digital sensor that stabilizes the rotor head and functions as a heading hold gyro. 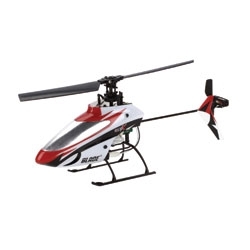 This, along with its powerful motors and high-precision cyclic servos, gives the mSR X a sense of stability and responsiveness no other fixed-pitch heli its size can match.